Keep drinks perfectly chilled in a freezable ice cooler bag that does the job without needing any extra ice packs. Freezable gel liner built into the fold-flat walls of the bag means it can go straight from the freezer to picnics, parties, or even out to the backyard and keep 9 or 18 cans cool for hours. It can also make room-temperature drinks cold, dropping their temperature by 25 degrees in the first hour. Dimensions: 9 Can: 7.25" x 9.75" x 8.5"; 18 Can: 9.5" x 11.5" x 8.5"
Weight: 9 Can: 1.92 lbs. ; 18 Can: 2.3 lbs. Purchased this to use for my assembly and it came 2 days before, but enough for 2 for lunch and keep it cold. Love it and you will too. I drive a school bus and take many field trips. It it was unable to keep beverages close to cold. 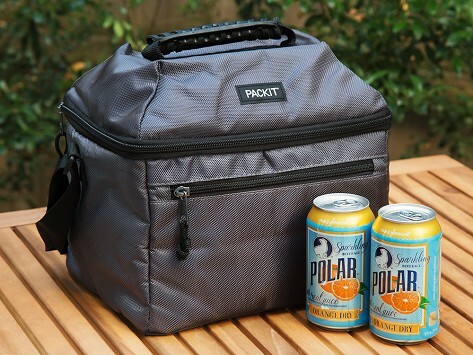 Melissa Kieling was a mom on a mission when she created PackIt ice cooler bags. She was looking to make an ice pack replacement that would do the same chilling job in her kids’ lunch bags, without the actual ice pack that inevitably didn’t make it home from school. So like any good Maker, she went the DIY route and made her own solution. The first prototype PackIt bag consisted of a shower curtain and a set of quilted ice packs that Melissa had her dry cleaner sew together. It did the trick, and kept the kiddos’ fresh snacks cool and, more importantly, un-soggy. When other moms eyed her creation, Melissa knew there were other folks out there who would appreciate her cool solution. We launched that first PackIt lunch bag in 2010, and are just as excited about Melissa’s newer designs. The grocery bag, can cooler, lunch bag, and lunch tote all go straight from the freezer to wherever you need to keep food and drinks cold—like the office, school, farmer’s market, picnic—thanks to the freezable gel sealed inside the walls of the bags. No more lost (or drippy) ice packs, and everything is kept cool and fresh. We think Melissa’s idea for a replacement is even better than the real thing.